Town & Country ... is set in private lush gardens with many colourful Mediterranean flowers. It has a delightful swimming pool, surrounded with lounging area. There is a lawn for games and recreation, some gym equipment, covered table tennis, BBQ and outdoor dining. There are 6 bedrooms, 2 kings sized 2 double, 2 twins. Check in 15.00. Check out 10.am. Perfectly situated in walking distance from the cosmopolitan town and beaches of Santa Eulalia, with its splendid promenade, shops, renowned restaurant street and recently developed Marina. The villa is set amongst a number of beautiful villages, giving you the chance to experience the Islands unique culture. 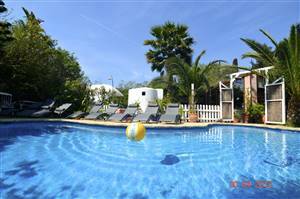 It is conveniently set just a few minutes walk to Santa Eulalia Marina,town and beaches and small bays. Ibiza Town. Main lounge with magnificent high beamed ceilings- large flat screen tv, satellite, DVD and wifi. Lovely dining area with solid wood table. King sized bedroom with enclosed ground floor patio adjoined by twin bedded area suitable for young children that need to be close to parents.